I thought everyone must be posting about a different Priory, but no. Clearly there are lots of people who think overpriced gassy lager and supermarket wine are the cornerstone of a good pub. There tends to be one actual beer on tap - they vary it from time to time - but it's often undrinkable as they seemingly have no idea how to look after it. Given the number of great pubs in the area I'm amazed this place can keep going - I guess the lowest common denominator works for them. 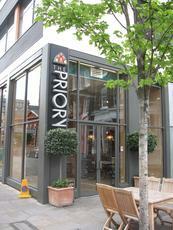 Thankfully we were lucky enough to have worked near the Priory in the past, it therefore was the obvious choice for us to hire for the Saturday (4th July) evening to hold our wedding reception. From the moment we met Oliver (yes the sideburns are impressive!) we were pretty confident everything would run smoothly, and it turns out our confidence was proven correct. He let us have free rein in the pub moving tables, putting up decorations and taking control of the stereo. The pub also divided up great for a dance floor, bar and outside area for the guests. We requested food for 20 odd people and we were not disappointed with the results, the chef put together an amazing menu for a very reasonable price and no one left the table without making the best effort to clear their plates or sober! The pub is a great venue, the bar staff manager and kitchen team are absolute stars and I would not hesitate in booking this venue for another "important" event or just simply heading down there for a beer and some food. Many thanks to you Oliver! I have just had my 30th birthday at The Priory and it couldnt have gone better. Everyone remarked on how sperb the venue was- they catered for my every need from, food, drinks to DJ equipment. There is outdoor space too which made it very special. I partied with my closest friends and the bar staff were brilliant. Would recommend it to anyone looking for a party venue which is off the beaten track but still in central London. The only problem was that it had to end! Rainbow warrior (see comments below) can't be a real person surely?? Must be a Tim-nice-but-dim p*ss take? Using words like "Marvellous" and "jog" and "Josh" and "aerobics" and "to die for" and "zoning out"
Funniest review I've ever read.